Unlike the exfoliating and soothing oils traditionally associated with wet shaving, shaving cream is essentially face spackle – a fluffly barrier of marshmallow chemicals that is meant to make sure that scratchy razor doesn’t harm your pretty little face. It’s mostly made of water, but there are also some herbal infusions included in many fancier creams that offer the majority of the real benefits you’ll get from shaving cream when shaving with a safety razor. For example, aloe and chamomile can help to stop skin inflammation, and calms or soothes the skin while it is being shaved so as to avoid irritation. The chamomile stops you from flaring up, and the aloe heals your skin after you’ve done the deed. Of course, not all shaving cream ingredients are created equal; these herbal infusions are combined with various acids (including stearic acid, myristic acid, coconut acid, etc.) and essential oils to create that foaming sensation that occurs once you shake the can and spray it into your hand. The aerosol fluffs up the water (which in turn carries the chemical compounds and herbal infusions in questions) to create the foam, so you can more easily apply it to your face. Then, like you’ve been doing since you were thirteen, you slapped that stuff on your face and went about the business of shaving with your rubbery Bic razor. While this seems like a perfectly reasonable and safe way to shave your skin, you might want to take a closer look at the shaving cream ingredients in your spray can of choice – you might be surprised what effects they’ll have on the body. First of all, there’s propolene glycol, which acts like glycerin and is usually found in brake fluid and antifreeze – that’s something you wouldn’t normally slap on your face, is it? On top of that, there’s triethanolamine, also called TEA – that’s an emulsifier, meant to allow everything to combine with each other to from the aforementioned foam and stop the water and oils from separating. However, it’s gotten a lot of flak lately for being a skin irritant; I may be wrong, but that may be the wrong thing to have in a product that’s meant to help your skin. Not only that, some TEA-based formulas have links to cancer through their possible contamination by nitrosamines. Two other common ingredients found in shaving cream are sodium laureth sulphate (SLES) and sodium lauryl sulphate (SLS); these two ingredients are meant to increase the lathering ability of the shaving cream, but they’ve also taken a lot of heat for doing some nasty stuff to the body. SLS has a very similar makeup and properties to estrogen, which is bad if you’re a woman shaving; SLES, in turn, is known to often carry dioxane within its makeup – that’s known to cause cancer. One bad shaving cream ingredient you might not expect is mineral oil. Sounds pretty natural, right? Well, that fancy name is pretty much the perfect smokescreen to hide the fact that it’s made from petroleum, aka dinosaur bones, aka the same basic product we fight wars over and put in our gas tanks. While this all sounds vaguely scary, the specific reasons you should fear mineral oil is its skin-blocking properties; when you put it on, it just sits there on the skin, locking in moisture but also blocking pores. Since it’s such an unnatural oil, you really don’t want to put it on your face – it’ll just lead to pimples, ingrown hairs and an overall greasy feeling on your face. First, not all shaving creams are bad. If you want to see some super high-quality creams, check out a few of the products offered by our friends at West Coast Shaving. Now that you know how bad shaving cream ingredients are, you might be in a bit of a moral quandary. What should you do now? Shaving creams basically just block your face with a bunch of acids and chemicals, some of which might give you cancer or just plain make your face spotty. At the same time, you don’t want to shave dry – that’s an even bigger problem. Well, since shaving creams use a lot of unnatural oils, you want to put more natural oils on your skin, like plant-based oils – these will actually be absorbed by your skin and appropriately nourish it, making the surface ideal for shaving. This is where more natural shaving creams come in, like Martin de Candre or wool fat shaving soaps; these oils and fats are all natural, they’ll make a nice lather if you work at it, and with the right double edged razor you’ll be able to get an even closer shave than you could imagine. 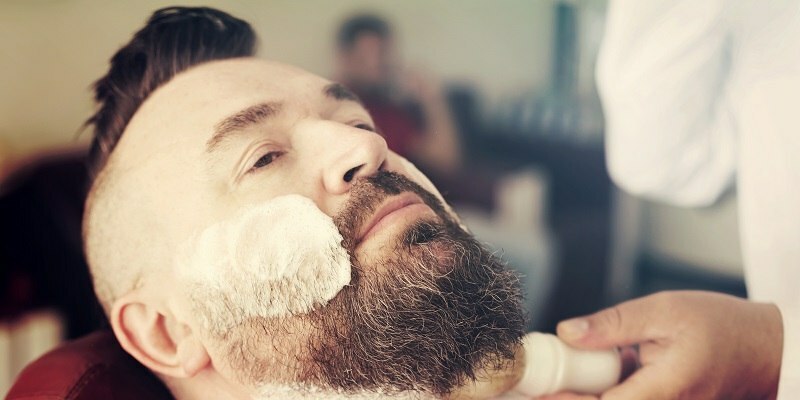 While shaving creams may be what you know, and hold to dearly as a daily tradition, the detriments to your skin and health are pretty evident based on the unhealthy nature of their ingredients. In order to avoid that chemical cocktail, wet shaving soaps are probably the way to go – they’ll be all natural, you won’t have that weird feeling of spraying it out of a can onto your hand, and you’ll know that you won’t be hurting yourself down the road. Picking a set of shaving cream ingredients with more natural lubricants and herbal infusions will go a long way toward keeping that pretty face as healthy as can be.